A teenage boy goes from canine-phobic to animal shelter volunteer in this good-natured coming-of-age story. 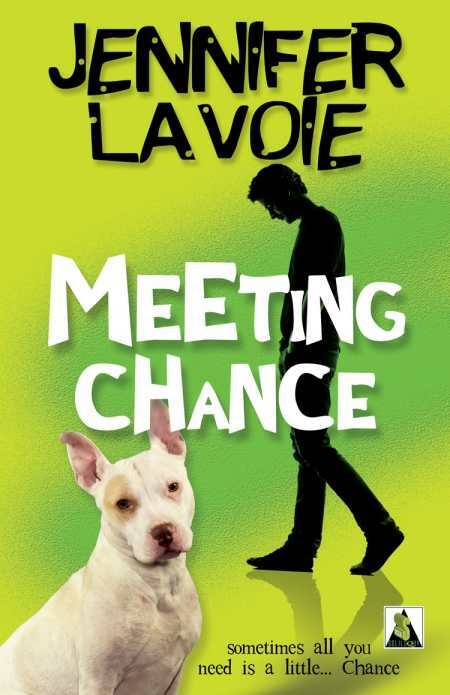 In her second young-adult novel, Meeting Chance, Jennifer Lavoie again applies her hopeful outlook to the halls of high school, this time tackling—and debunking—the superficial judgments on which adolescent self-esteem often turns. Like Andrew Morris in Lavoie’s popular Andy Squared, Aaron Cassidy is a gay teenager in a world that doesn’t understand him. Rather than focus solely on people’s reaction to Aaron’s sexual orientation, however, Lavoie opens the door on multiple types of discrimination through Aaron’s evolving relationship with a misunderstood, abused pit bull named Chance. The teenagers in Meeting Chance are generally cheerful kids, and even when life has dealt them a rough hand, they work hard to improve their situations and themselves. Aaron, the scarred victim of a dog attack when he was nine, decides to overcome his fear of dogs by facing it head-on: he not only volunteers at a local animal shelter but starts educating the public about the variability in dog breeds as well, reminding them that labels like “pit bull” don’t always tell the whole story. At the shelter, Aaron meets Finn, a high-school senior who works two jobs in the hopes of putting himself through college and escaping a chaotic home life. Lavoie’s assumption that teenagers are strong, smart, and tenacious in the face of life’s challenges is refreshing. Lavoie examines the setting for Aaron’s journey in loving detail, showcasing the training, caretaking, planning, and plain old hard work that goes into running an animal shelter and getting abandoned animals into new homes. We get to know Chance’s gentle spirit as he tries to get his large body onto Aaron’s small lap or plays with the shelter’s kittens. As much as we root for Aaron to overcome his fears and find friends who understand him, we want Chance to love and be loved. It’s this question—who will adopt a disfigured pit bull?—that engages the reader in the outcome. The most apt reader for Meeting Chance is the young teen developing a sense of self. Aaron’s story might seem simplistic to older teens or young adults looking for a more gritty treatment of teenagers’ dilemmas, but it serves up a wholesome role model for younger kids to consider as they try to figure out how they fit into the world.